Ongoing readers of my weekly dalliances into the world of faux-critiquing will know I like stories where not everything is spelled out. 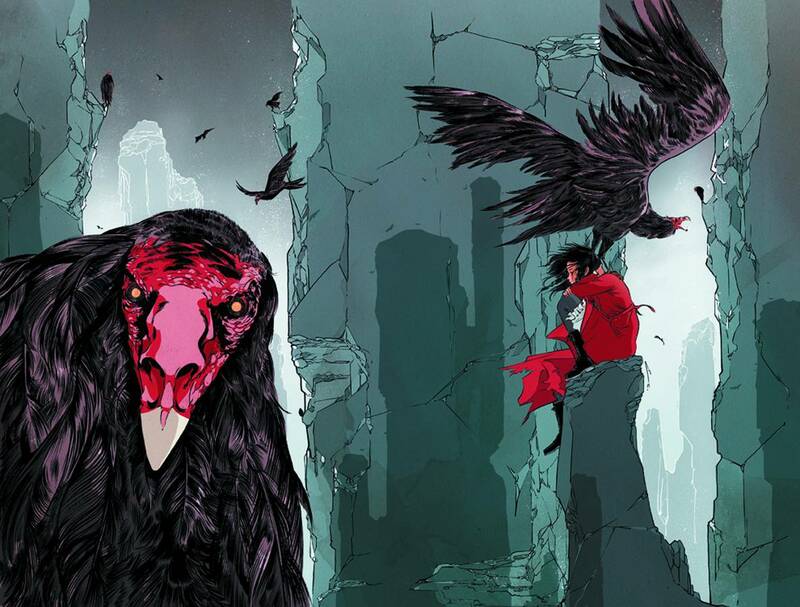 Writers like Jonathan Hickman and Grant Morrison pen stories that leave gaps in connecting story threads or ideas, inviting readers to join the dots themselves. Look at elements in Batman Incorporated: the frenetic pacing of panels, lack of much expository dialogue and brief mentions of elements that are linked (like the Ourobouros and Leviathan) prompted readers to realise things themselves without too much hand-holding. It’s an appealing style that I like when reading stories with depth and a lot of moving parts. It’s also a style that can completely hamstring a book when there’s not enough hand-holding occurring. Giving us bits and pieces without enough context to solve the puzzles or realise settings ourselves isn’t enough to keep a reader’s interest. 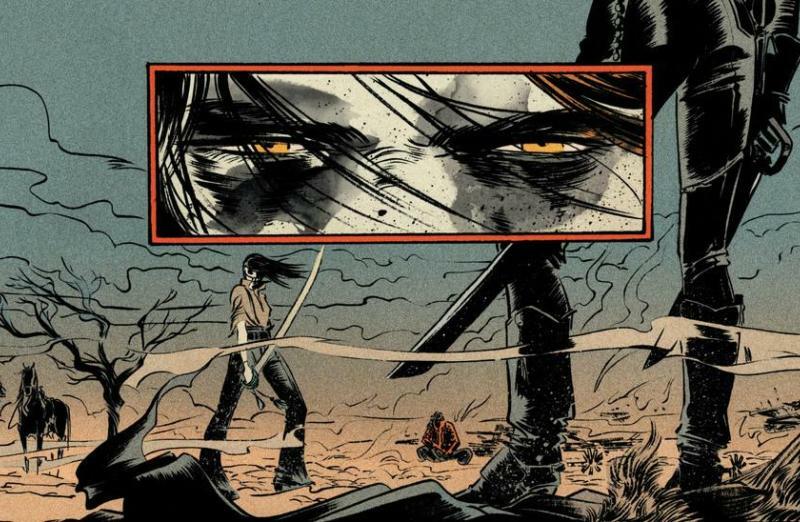 This is something that, until the last issue of the book, I was fairly sure Pretty Deadly would completely succumb to. The gothic fantasy by way of a Sergio Leone film tells the story of Death’s daughter, Ginny, who is a bounty hunter-type figure hunting down Sissy, the pre-teen unassuming spawn of some devil blood ritual shenanigans. Assisting (or impeding) Ginny’s quest is Fox the Mason, a big blindfolded dude who’s secretly protecting the devil spawn child in question, Johnny, a womanising bounty hunter assisted by a talking raven called Molly, and Big Alice, an albino hunter who might also be something supernatural and who turns into a cloud of butterflies when killed. Because, don’t we all? Now, everything I’ve just put in the description above sounds intriguing, right? It’s especially so when you keep in mind the writer is Kelly Sue DeConnick – penwoman of the superb Captain Marvel books – and the artist is Emma Rios – whose weird, off-kilter artwork didn’t work so much for In Pursuit of Flight but is perfectly suited for a gothic fantasy western where Death has a head made from an armadillo’s skull. What prevents the book from an immediate gold-starring is a distinct lack of context. From the off, very little is explained about who our protagonists are, what they’re after, how they know each other and why the reader should care. Granted, the impetus for Ginny’s hunt is explained through an overly-expositional kind of Western slam poetry delivered by Fox and Sissy to a crowd of rapt listeners, but apart from that there’s so little explanation for anything going on that I couldn’t help but feel adrift in a flood of scenes and dialogue. There’s no connective tissue; is Fox friends with Ginny, or do they hate each other? Who’s the woman Death keeps imprisoned in his subterranean hell? Why can’t she escape? Why does Alice hate Ginny if they both work for Death? Is the story Fox and Sissy tell at the beginning literally an exposition on Ginny’s origin, or are elements exaggerated to make it a story rather than a recounting? What’s the debt Fox owes Sarah, the lady who harbours him and Sissy when Death’s agents start chasing them? As I said, I can dig stories where not everything is handed to the reader on a platter, but a little something to ground us in the story’s goings-on would’ve been nice. There’s far too much emphasis on past events and lack of explanation for things to be hand-waved as unimportant – like that debt Fox owes, lingered on for too long to be convenient to the plot but not long enough to explain its importance – and most of it’s the kind of stuff that’s necessary for even the most elementary understanding of events. A bit more sinew might’ve made the skeleton move a bit less awkwardly, and though there is (some) explanation of things by story’s end I still feel that DeConnick could’ve given us just a little bit more. I considered putting the book down halfway through, which is never a good sign in itself, but when it’s written by an author I really enjoy and respect that makes it a double Red Alert. The other big problem Pretty Deadly deals with is a lack of distinct protagonist. No-one – literally – is given enough development or time in the sun to stand out as the principle character, or even one of an ensemble of them. The closest we’d probably get is Sissy, but considering she spends most of the story either cowering in fear or, y’know, being a kid, it makes it as hard to take her as a protagonist as it was to handle Anakin Skywalker in the Star Wars prequels. Ginny certainly gets a fair amount of attention both on-panel and in the story’s myth arc, but isn’t fleshed out or followed nearly enough to be the closest thing we have to a hero. Similarly, Fox takes centre stage quite a bit, but a plot development towards the book’s end casts doubt on his long-term involvement with the series. Wannabe desperado Johnny might be it, but after the opening chapters his presence kinda fades into the background a bit. I guess maybe we should call the arid desert landscape itself the protagonist, since it’s considerably more present and fleshed than the other inhabitants that occupy its flat and well-tramped surface. Both these issues lead me to conclude Pretty Deadly should be read the same way one reads an H.P. Lovecraft story: you’re here for the setting, the bad guy, and the tone. The protagonist of most stories in the Cthulhu Mythos is secondary to either Cthulhu himself (or whichever otherworldly abomination is present) or the dark, gothic horror atmosphere the story pumps into your brain like reverse-dopamine. You read a story to get the sh*t shocked from you, not to follow the ongoing struggle of a perfectly sane man who slowly slips into madness at the first sign of rats in the walls. That’s not a bad way to write a story, but it’s best to declare those intentions up front and not lead readers on expecting some depth to the characters when little is present. Linked to this latter point is the dialogue. As I said, there’s little connective tissue between events on-page and what’s come before, so dialogue is informed by this lack of information. Characters speak to each other without exposition on past events, which is a double-edged sword; they don’t sound like unreal robots offering plot information the other character knows but the reader doesn’t, but they do sound like people conversing in a manner of shared understanding. The Western setting also means many characters speak in clipped sentences, lacking words, ending letters and proper sentence structure in places. I’m a big fan of Western dialogue, so while subjectively I lapped that up (as much as one can without full in-story context) objectively you may find it difficult to get into. Put it this way – if you made it through the “Sloosha’s Hollow” chapter of Cloud Atlas without shoving the book in a blender, you’ll dig this. 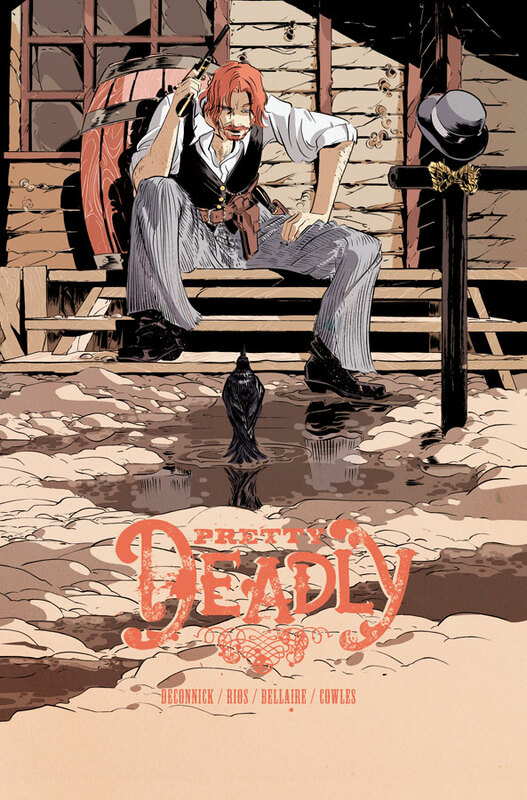 So I guess you’d call Pretty Deadly a predominantly atmospheric piece. As I said that’s not a bad thing in and of itself but the opening premise of the story, and constant switching between characters who aren’t as shallow as a teaspoon but lack the depth of a glass of water, lends itself to a narrative significantly different from the one in your hands. Fortunately, the one thing that works gangbusters for that different narrative is the artwork. You may recall in my review of DeConnick’s previous Captain Marvel books that I was not a fan of Emma Rios’s artwork; I opine hers and fellow artists Dexter Soy and Filipe Andrade’s work would’ve functioned better in a surreal, off-kilter story that better matches their particular style of art. And lo, have I been proven right! 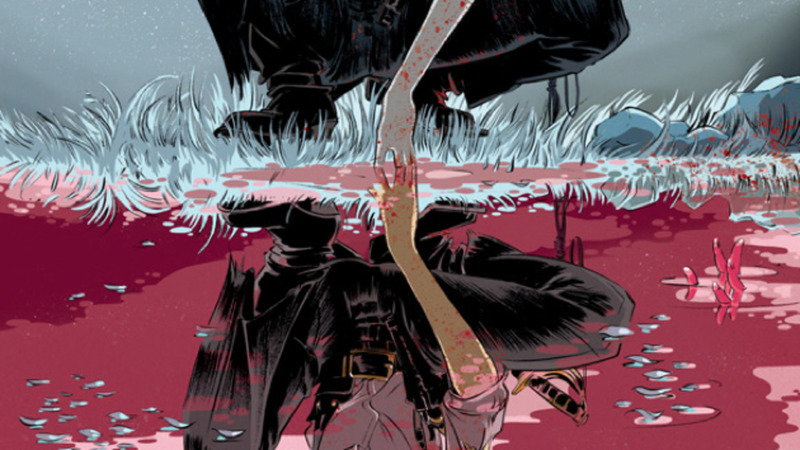 Rios is in top form on Pretty Deadly, her bleeding together of background colour and character details evoking the harsh pencils and expressive stylings of Alex Maleev and Greg Capullo. The costumes not only look awesome but also provide plenty of cosplay fuel. The darker, gothic elements – particularly Death and all his friends – have inspired designs, colouring and form. 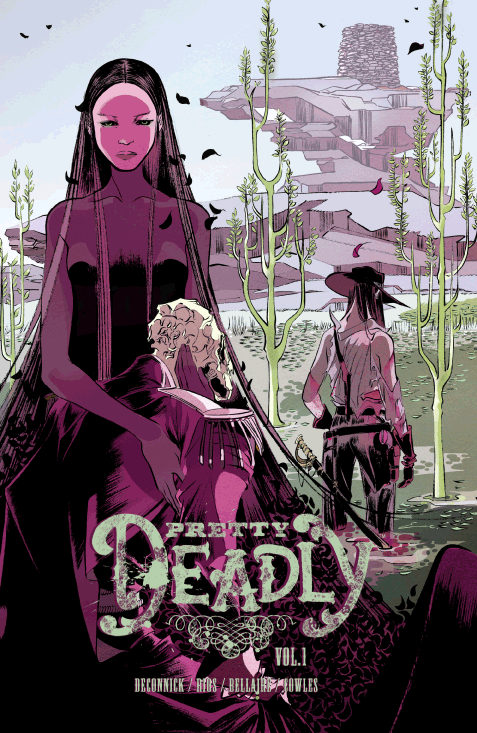 If nothing else, Pretty Deadly is a pretty pretty book. Ugh. Enough with the puns, Christopher. At the end of the day I can offer Pretty Deadly as a recommendation, and it certainly lives up to claimants who trumpet it being different and structurally daring. As much as I ended up enjoying it, I do append a massive asterisk to the front cover for any planning to dive in: be aware of the book you’re about to read. This is not a superhero comic, nor is it a straight Western. It is not The Sandman, nor is it The Walking Dead. It’s a different animal to almost anything I’ve ever read, for better and worse, and you owe it to yourself for the experience alone.